This safari package will take you to Maasai Mara National Reserve and Lake Nakuru National Park. Maasai Mara National Reserve and Lake Nakuru National Park are the most famous and the most frequently visited in Kenya due to their uniqueness. This safari will start with the Maasai Mara - Kenya's finest and most outstanding wildlife sanctuary where gentle rolling grassland ensures animals are never out of sight. Join Great Horizon Trails for the best safari experience! Minimum age of participation: 3 years. During this 4 days' safari, you will be accommodated at Miti Mingi Eco Tented Camp while in Maasai Mara National Reserve, and in Citymax Hotel in Nakuru. Accommodation type: Mid-range accommodation. You'll drive in from Nairobi in the morning through the dramatic Great Rift Valley with a stopover at the view point and Narok town for lunch to the Masai Mara National Reserve to begin your trip. This enormous reserve is actually part of the vast Serengeti plains famously known for its spectacular great wildebeest’s migration and is the home of the Big Five: lion, elephant, leopard, buffalo, and rhino. 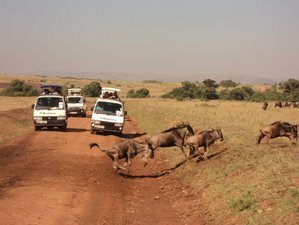 On arrival, you will enjoy an evening game drive. Your dinner and overnight will be at the campsite. You'll spend a full day in Maasai Mara with morning and afternoon game drives. This game drive will be in search for great predators and perhaps even cubs. On the plains, there are enormous herds of grazing animals plus the elusive cheetah and leopard hiding amidst Acacia boughs. During your stay, you'll also have an optional opportunity to visit a village of the Masai people or an early hot air balloon. Your dinner and overnight will be at the campsite. You will enjoy a pre-breakfast game drive in the morning before you depart to Lake Nakuru National park which is in the Great Rift Valley with lunch en route. On arrival, you will check in a budget hotel for dinner and overnight. You will enjoy an extensive game drive after breakfast then depart after lunch to Nairobi where your safari will end. Maasai Mara National Reserve offers the sensation of the great wildebeest migration between July and October which is unparalleled and make it the 8th wonder of the world. Centuries of close association with the wildlife has resulted in an almost symbiotic relationship where wildlife and Maasai people live in peace with one another. Lake Nakuru National Park is dominated by a gently undulating terrain with open bush and woodlands, typical of the dry Rift Valley vegetation. 27% of the park is composed of the Lake Nakuru waters. The Park was declared a Rhino sanctuary in 1983. The rest of the payment should be paid 13 days before arrival. Great Horizon Trails is a tour and information company based in Nairobi, Kenya that seeks to deliver value-added safaris to the enterprising tourist.